Panel Urges Lung Cancer Screening For Millions Of Americans : Shots - Health News Most people get diagnosed with lung cancer when it's too late to effectively treat it. A federal panel is trying to improve the odds by saying that longtime smokers and former smokers should get annual CT scans to check for lung cancer. A federal task force is planning to recommend that millions of smokers and former smokers get a CT scan annually to look for early signs of lung cancer. The 16-member US Preventive Services Task Force gives that lung cancer screening test a grade of B, which puts it on the same level as mammography for women between the ages of 50 and 74. That grade is important, because preventive tests with a grade of A or B oblige Medicare, other federal health programs and private insurers to cover the entire cost, beginning a year after a guideline is adopted. A lung scan costs about $300 to $500. "This is the first time we've had science that tells us that we can actually avoid some lung cancer deaths through screening," task force vice chairman Michael LeFevre tells Shots. "So this is really a big change." It's a change that some won't welcome. Some experts warn that it's going to cause too much follow-up testing for many patients, with the accompanying anxiety. Another concern is that screening will uncover many cancers that would never have caused a problem – a phenomenon called overdiagnosis. An explanation of the proposed recommendation appears today in Annals of Internal Medicine. It's based on a federally financed study of more than 50,000 people published two years ago. The task force estimates that its proposed recommendation will cut U.S. lung cancer deaths by 20,000 a year. That's only about 13 percent of the nearly 160,000 people who die of the disease in this country annually. "That's a relatively small proportion of those 160,000 deaths," LeFevre acknowledges. 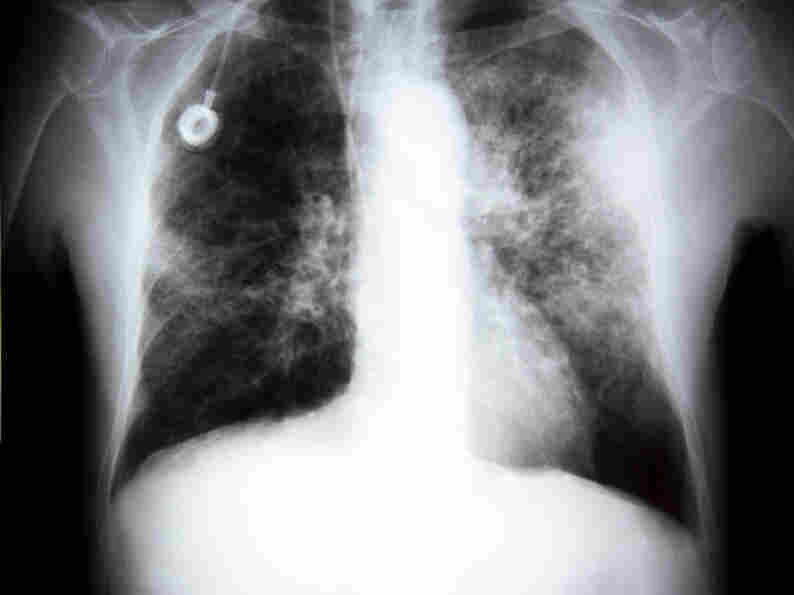 The problem is that even with screening, many people's lung cancer will be too advanced for effective treatment. "But a small proportion of a big number is still a big number," adds LeFevre. "And 20,000 lives is a lot of people." This is the first time we've had science that tells us that we can actually avoid some lung cancer deaths through screening. He says the lung cancer screening test – a computed tomography or CT scan – is actually more effective than mammography or colonoscopy in saving lives. Under the panel's proposal, screening is expected to save one life for every 320 people screened. By comparison, it takes 900 to 1,900 mammograms to save one life from breast cancer (depending on whether those screened are older or younger). And LeFevre estimates that it takes about 500 colonoscopies to save a life from colon cancer. The task force will consider comments on the proposed guidelines before issuing a final recommendation in three to six months, LeFevre says. Tom Murphy, a 61-year-old Maryland man, has no doubt that annual screening prevented him from dying of lung cancer as his father did. Murphy, who smoked for three decades, started getting yearly lung scans in 2005 as part of a study. Five years later, a scan showed that a spot on his right lung was growing. "Oh absolutely, that scan saved my life," Murphy tells Shots. "This thing started at five millimeters in January of 2010 and at the point they took it out, it was 1.2 centimeters, nine months later. So I'm very grateful. And I believe to this day that it saved my life." The proposed recommendation is aimed at people who are at especially high risk of lung cancer. They're between the ages of 55 and 79 and they have smoked the equivalent of a pack of cigarettes a day for 30 years or more. If they have quit smoking, it must be within the past 15 years. After that, people have gained enough benefit from not smoking that screening isn't useful, the panel says. Nearly 90 million Americans are smokers or former smokers. About 7 million of these are in the target age group and have smoked at least a pack a day for 30 years. The Task Force is trying to strike a crucial balance – what LeFevre calls "the point at which (the screening tests) seems to do a significant amount more good than harm." A fundamental problem with lung cancer CT screening is that when it finds a suspicious-looking nodule in a lung, it turns out to be non-cancerous 96 percent of the time. That's called a false positive rate, and it may be higher than any other approved screening test. Most people who have a positive scan would be scheduled for a second scan several months later to see if the nodule has grown. If it has, the patient may need further scans, a biopsy of tissue through a needle inserted into the lung, or even lung surgery. "We are actually going to do some lung surgery on people just to prove that they don't have cancer," LeFevre says. He says people who have an abnormal lung scan are going to have to be calm, patient and deliberate – and their doctors are too. "This is an anxiety that I have about lung cancer screening," says LeFevre, who is an associate professor of family medicine at the University of Missouri. "If somebody hears they have a 5 percent chance that this is cancer, and then you say, 'Well, let's wait three months and repeat your CAT scan,' if the emotional response is, 'No, let's do something now," then we're going to do a lot of harm in the process of doing a little good," LeFevre says. Dr. Kenneth Lin of Georgetown University thinks the task force is putting too much faith in lung screening. "They rank it with those tests that your doctor – if they're a good doctor – is supposed to bug you about to get done," Lin says, referring to mammograms, colonoscopy and Pap smears. "And I don't feel that this test necessarily meets that criteria. I don't necessarily feel that patients should be pressured into getting this test done." He and others worry not only about the high false-positive rate and the ensuing medical tests, but also what doctors call "overdiagnosis" – the discovery of cancers that would never become a problem. "Uncovering this reservoir of indolent disease will almost always happen when you start screening," Dr. Laura Esserman, a breast cancer specialist at the University of California San Francisco, tells Shots. "We need to recognize it and understand it. Because if you don't, you're going to overtreat people." Esserman is coauthor of a commentary on overdiagnosis and overtreatment of cancer published online Monday by JAMA, the journal of the American Medical Association.